Three sub-regional migration areas: Côte d’Ivoire and Nigeria make up the two main poles of migration in the region. They are the main receiving countries for emigrants from neighbouring countries. 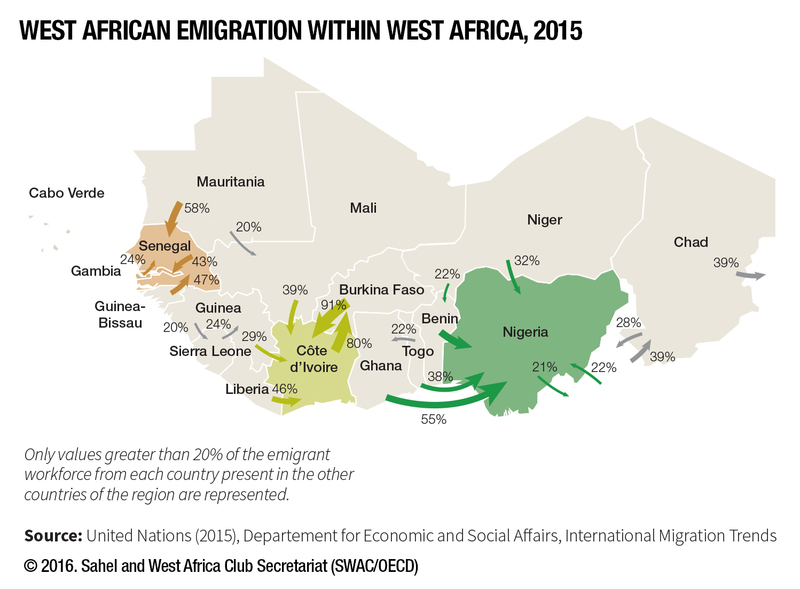 Senegal and Gambia make up a third pole of migration. But the official figures belie a much larger migration. The Nigerian Population Commission believes that, although a little over 1 million ECOWAS nationals are officially registered as living in Nigeria, the real numbers could be as high as 3-4 million. These maps are without prejudice to the status of or sovereignty over any territory, to the delimitation of international frontiers and boundaries and to the name of any territory, city or area.